Looking for fuller and healthier-looking hair? Extensions may be perfect for you. XEX's experienced team of extensions specials provides a variety of types of extensions to fit any style or occassion. Do you want to try a new hair style, but your hair doesn’t have the volume or body to pull it off? Hair extensions give you the ability to have any style, texture or color you want. When you trust XEX’s hair extension specialists, you can be confident that you’re getting the highest quality extensions available. We’re thrilled to provide our clients with Fusion Hair Extensions, Micro Bead Hair Extensions, Tape-In Hair Extensions, and Clip-In Hair Extensions. We also provide hair extension removal. 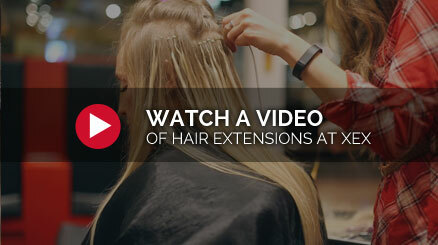 Let XEX’s experienced team provide you with the perfect extensions for the look you desire. We use only the finest hair extensions products, including Donna Bella, Glamour Hair, Locks and Bonds, Hotheads, Great Lengths, and Toni Odisho. Adding body, volume and length to fine, thinning or damaged hair. Give fine hair extra volume and body. Enhance personal confidence and self-image. Start fresh! Give yourself a completely new look.